There are two main types of Nitrous Systems that are used to produce more horsepower in both cars and trucks. There is the dry and the wet nitrous kit. This kit is called "dry" because it injects only nitrous into the engine, and not fuel. The dry kit is for people who want a set that allows them to let the ECU or computer automatically add appropriate amounts of fuel to compensate for the added nitrous into the motor. The wet kit injects both nitrous and fuel into the engine at the same time. 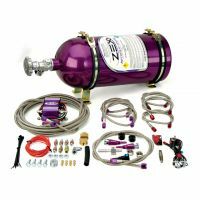 As with the dry system, you still need to have enough fuel in your fuel system for the wet nitrous system to be able to use while the nitrous is being injected. Some how you have to suply extra fuel, which have to be done by reprograming the ECU or any other way.